If you’re looking for a new fashion statement that’s right on trend you need look no further than your hair. Braids are not only trendy but also chic. Learning how to do a headband braid is super simple. Whether you want a French Braid or a regular style, the following options are quick and easy to do. This one takes a little practice if you haven’t done French Braids before but is so worth it in the end. Make sure your hair has been brushed until smooth. Part the hair in the center of the head or on the side. Section the hair all the way around the head 3″-4″ from the crown. You’ll end up with a circle around the head with hair on top and hair below the line. The hair below the line will be braided whereas that on the crown will made into a pony tail. Twist the hair on the crown and spiral it into a bun then clip it into place to keep it out of the way. Begin your French Braid at the part. Start by taking a small section and divide it into 3 parts. Cross the right over the center. Add some hair to what is now the center strand then cross the left over the center. Add some hair to what is now the center from the left side. Continue working until you get to the center back then secure it with an elastic band. French Braid the hair on the other side the same way then secure it in the elastic band along with the first braid. The ends of each braid will be added to the pony tail. Unclip the hair on top the head and smooth it down to the back. Pull it to the bottom of the head in back and gather into a ponytail. Secure it and the tails of the original braids in another rubber band. Take a small piece of hair from the left and wrap it around the rubber band until you get to the end. Tuck the tail under the rubber band then bobby pin it in place. A Dutch Braid is simply a French Braid upside-down. Once you’ve mastered the French Braid then the Dutch Braid is easy. Brush the hair smooth then section the front from the back with the end of the rat-tailed comb beginning and ending just behind each ear. Clip the hair in back out of the way on each side as well as on top. Beginning just behind one ear, take a small section and divide it into 3 parts. 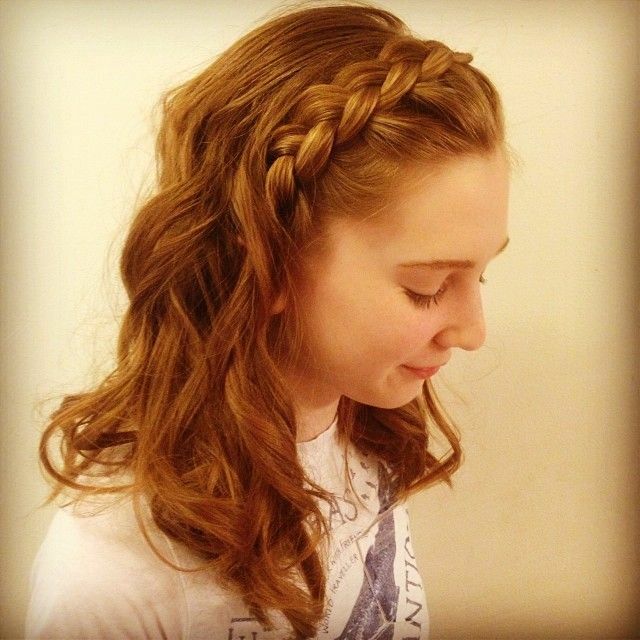 To create the Dutch Braid the center section will be pulled up while the top section is pulled down as you braid. Use the hairline as a guide to keep the braid straight. As you braid your way up, add small sections of hair on each side just as with the French Braid. Continue working until you get to the other ear then continue braiding normally until you get to the end of the strands. Secure them with a rubber band. Use a bobby pin to even out each section of braid. Take the clips out of the back of the hair and curl it as you would normally. For medium length hair you can divide the curled part in back across the middle then place the braid tail along the line and pin it in place. For longer hair, take the braid and wrap it under all the loose hair then tuck it in behind the braid on the other side and pin it in place. Shake your loose hair out to finish. If you’re having difficulty learning the French Braid you might try a Twisted Braid that looks like a French Braid. Brush your hair straight and part it on the side. Tip you head slightly forward so your bangs fall toward your face. Take a small section of hair and divide it into two parts then cross the left over the right. Pick up a little more hair from the front then cross it over and add it to the pile in the right hand. Continue working your way down the strip until you get to your ear then curve the twist around to the center back of your head. Hold it secure with a clip. Do the other side the same way then attach the two braids with a rubber band. Simply shake out the ends of your loose hair to finish. This one looks best with really long dry hair. Comb the hair smooth then, with the rat-tailed comb split it down the middle. Secure one side so it doesn’t get mixed in with the other while you work. Divide the hair from the back of the ear into 3 section and braid it normally about 3 times. Pull the braid up toward the front and Dutch Braid (as explained earlier) from there to the other ear. On the other side, gather the remaining hair and continue braiding to the end then secure it with a rubber band. Wrap the remaining braid over the front of the head behind the first braid and pin it into place after tucking the tail under the braid. Just because you have short hair doesn’t mean you can’t join in on the fun and wear a braided headband. Try using extensions that can be clipped on and cut off to any length that suits you. A block of wood with 2 nails in it set 4″ apart. Comb the extensions so they don’t have tangles. Tie the string around one of the nails, stretch it to the other nail then tie that side off. Secure it with clamps to a work space. Hair extensions have a tendency to be thin so clip several extensions to 3 separate sections of the string. Each section will represent a section of the braid. Grab each section and braid normally. Pull the right group over the center then the left group over the center. Continue the pattern to the end. Decide how long you want it, put the rubber band there and cut off the remaining hair below the rubber band. Fasten the clips together. To secure them add a rubber band below the clips. Under the hair, bobby pin one end of the braid in place by running it through the rubber band and into the hair. Wrap the braid over the head in front and fasten to the hair by running the bobby pin through the rubber band at the other end first then attaching it to the hair. Add extra bobby pins across the front of the band to secure it to the top of the head. Comb your short hair in place making sure to cover any bobby pins or rubber bands that may show. Creating a fancy ‘do’ doesn’t have to cost a lot. Whether you want to make something for a special occasion or just to keep the hair out of your eyes, your own hair works just as good as something that costs a fortune. Best of all, once you learn how to do a headband braid you’ll be ready in no time. There are so many choices that the hardest part will be picking which one to try.